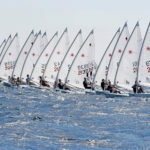 Half of scheduled races fulfilled now in Medemblik, Netherlands, where 2017 Laser Radial Women’s and Men’s World Championships are being held. 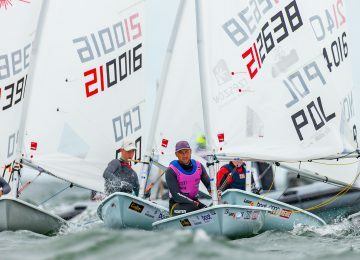 Steady 12 knots on the Ijsselmeer allowed two new races to be completed, being 6 now in total. This is first day with medium winds and scores suffered significant changes after light conditions experienced the days before. 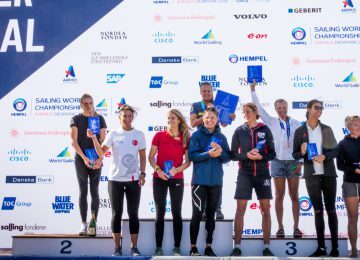 Evi Van Acker BEL (4-3-3-9-2-15) wrote her best and worst scores today and shares now Women’s leadership with Japanese sailor Manami Doi JPN (34-5-7-2-2-5) with 21 points. 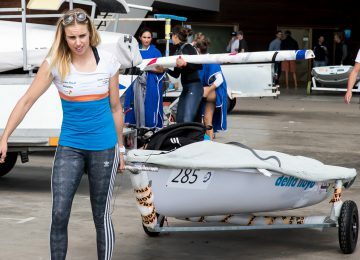 Svenja Weger GER (8-2-31-10-1-1) had a perfect day and scaled to third place overall, just 1 point behind leaders. 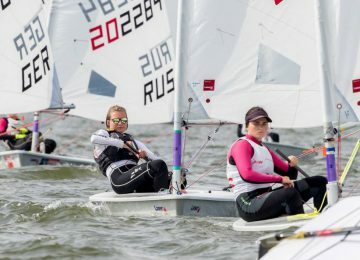 Great day also for current Olympic Gold medalist Marit Bouwmeester NED (29-27-3-6-1-2) recovering of a bad start and accessing now Top 10 qualification in 5th with 39 units, sharing score with Mathilde de Kerangat FRA (4-9-17-13-6-7) in 6th. 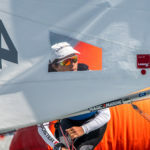 One point behind is Polish sailor Agata Barwinska POL (42-14-12-3-6-5) on 7th. Mária Érdi HUN (9-3-32-12-7-17) is also part of Top 10 with 48 points on 10th place. Really bad day for Cristina Pujol ESP (17-6-4-6-39-33) falling from 3rd to 20th place overall with 66 units. 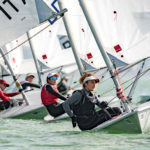 2017 Laser Radial Women’s World Championship – Full results. Also recovering of bad first results is Marcin Rudawski POL (16-15-1-3-6-1), now leading Radial Men’s world championship with 26 points. 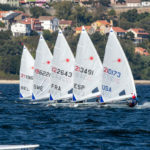 Just one point behind is French sailor Maxime Mazard FRA (2-35-13-5-2-5) in 2nd, also sailing in great shape. Third provisional place in podium for Alfonso Fernandez ESP (5-3-2-18-11-12) with 33. Overnight leader Axel Rahm SWE (3-22-5-1-29-4) is now fourth with 35 units. Eliot Merceron SUI, Andrea Ribolzi ITA, Nikita Melnikov RUS and Dominik Perkovic CRO are also among Top 10 in places 7th to 10th respectively. Terrible day for Daniil Krutskikh RUS (12-1-4-4-64DSQ-64BFD), falling from 2nd to 15th position on rank. 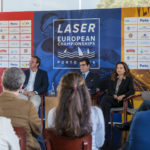 Go go go European sailors! 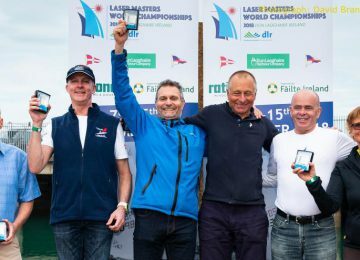 2017 Laser Radial Men’s World Championship – Full results. By Agustín Argüelles – EurILCA | Photo: Thom Touw Photography.